"Douglas A-4" redirects here. For the 1940 biplane, see Douglas A-4 (target drone). A U.S. Navy A-4E Skyhawk of VA-164, from the USS Oriskany, en route to attack a target in North Vietnam in November 1967. The Skyhawk is a relatively lightweight aircraft with a maximum takeoff weight of 24,500 pounds (11,100 kg) and has a top speed of more than 670 miles per hour (1,080 km/h). The aircraft's five hardpoints support a variety of missiles, bombs and other munitions. It is capable of carrying a bomb load equivalent to that of a World War II–era Boeing B-17 bomber, and can deliver nuclear weapons using a low-altitude bombing system and a "loft" delivery technique. The A-4 was originally powered by the Wright J65 turbojet engine; from the A-4E onwards, the Pratt & Whitney J52 engine was used. Skyhawks played key roles in the Vietnam War, the Yom Kippur War, and the Falklands War. Sixty years after the aircraft's first flight in 1954, some of the 2,960 produced (through February 1979) remain in service with the Argentine Air Force. The Skyhawk was designed by Douglas Aircraft's Ed Heinemann in response to a U.S. Navy call for a jet-powered attack aircraft to replace the older Douglas AD Skyraider (later redesignated A-1 Skyraider). Heinemann opted for a design that would minimize its size, weight, and complexity. The result was an aircraft that weighed only half of the Navy's weight specification. It had a wing so compact that it did not need to be folded for carrier stowage. The first 500 production examples cost an average of $860,000 each, less than the Navy's one million dollar maximum. The diminutive Skyhawk soon received the nicknames "Scooter", "Kiddiecar", "Bantam Bomber", "Tinker Toy Bomber", and, on account of its speed and nimble performance, "Heinemann's Hot-Rod". The XA4D-1 prototype set a world speed record of 695.163 mph on October 15, 1955. The aircraft is of conventional post-World War II design, with a low-mounted delta wing, tricycle undercarriage, and a single turbojet engine in the rear fuselage, with two air intakes on the fuselage sides. The tail is of cruciform design, with the horizontal stabilizer mounted above the fuselage. Armament consisted of two 20 mm (.79 in caliber) Colt Mk 12 cannons, one in each wing root, with 100 rounds per gun (the A-4M Skyhawk II and types based on the A-4M have 200 rounds per gun), plus a large variety of bombs, rockets, and missiles carried on a hardpoint under the fuselage centerline and hardpoints under each wing (originally one per wing, later two). The short-span delta wing did not require the complexity of wingtip folding, saving an estimated 200 pounds (91 kg). Its spars were machined from a single forging that spanned across both wingtips. The leading edge slats were designed to drop automatically at the appropriate speed by gravity and air pressure, saving weight and space by omitting actuation motors and switches. Similarly the main undercarriage did not penetrate the main wing spar, designed so that when retracted only the wheel itself was inside the wing and the undercarriage struts were housed in a fairing below the wing. Thus the wing structure was lighter with the same overall strength. The rudder was constructed of a single panel reinforced with external ribs. The turbojet engine was accessed for service or replacement by removing the aft section of the fuselage and sliding out the engine. This obviated the need for access doors with their hinges and latches further reducing weight and complexity. This is the opposite of what can often happen in aircraft design where a small weight increase in one area leads to a compounding increase in weight in other areas to compensate, creating a demand for more powerful, heavier engines, larger wing and empennage area, and so on in a vicious circle. The A-4 pioneered the concept of "buddy" air-to-air refueling. This allows the aircraft to supply others of the same type, reducing the need for dedicated tanker aircraft—a particular advantage for small air arms or when operating in remote locations. This allows for greatly improved operational flexibility and reassurance against the loss or malfunction of tanker aircraft, though this procedure reduces the effective combat force on board the carrier. A designated supply A-4 would mount a center-mounted "buddy store", a large external fuel tank with a hose reel in the aft section and an extensible drogue refueling bucket. This aircraft was fueled up without armament and launched first. Attack aircraft would be armed to the maximum and given as much fuel as was allowable by maximum takeoff weight limits, far less than a full tank. Once airborne, they would then proceed to top off their fuel tanks from the tanker using the A-4's fixed refueling probe on the starboard side of the aircraft nose. They could then sortie with both full armament and fuel loads. The A-4 was rarely used for refueling in U.S. service after the KA-3 Skywarrior tanker became available aboard the larger carriers. The versatility of the capability and the retirement of the Skywarrior meant that the Boeing F/A-18E/F Super Hornet now includes this capability. 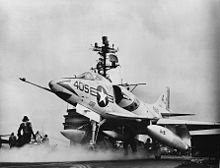 The A-4 was also designed to be able to make an emergency landing, in the event of a hydraulic failure, on the two drop tanks nearly always carried by these aircraft. Such landings resulted in only minor damage to the nose of the aircraft which could be repaired in less than an hour. The Skyhawk remained in production until 1979, with 2,960 aircraft built, including 555 two-seat trainers. The last production A-4, an A-4M of Marine squadron VMA-331 had the flags of all nations that operated the A-4 painted on its fuselage sides. The Skyhawk proved to be a relatively common United States Navy aircraft export of the postwar era. Due to its small size, it could be operated from the older, smaller World War II-era aircraft carriers still used by many smaller navies during the 1960s. These older ships were often unable to accommodate newer Navy fighters such as the F-4 Phantom II and F-8 Crusader, which were faster and more capable than the A-4, but significantly larger and heavier than older naval fighters. The Navy operated the A-4 in both Regular Navy and Naval Reserve light attack squadrons (VA). Although the A-4's use as a training and adversary aircraft would continue well into the 1990s, the Navy began removing the aircraft from its frontline attack squadrons in 1967, with the last ones (Super Foxes of VA-55/212/164) being retired in 1976. 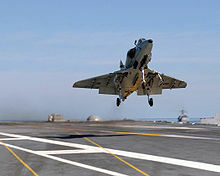 The Marine Corps would not take the U.S. Navy's replacement warplane, the LTV A-7 Corsair II, instead keeping Skyhawks in service with both Regular Marine Corps and Marine Corps Reserve attack squadrons (VMA), and ordering the new A-4M model. The last USMC Skyhawk was delivered in 1979, and they were used until the mid-1980s before they were replaced by the equally small, but more versatile STOVL AV-8 Harrier II. VMA-131, Marine Aircraft Group 49 (the Diamondbacks) retired its last four OA-4Ms on 22 June 1994. Trainer versions of the Skyhawk remained in Navy service, however, finding a new lease on life with the advent of "adversary training", where the nimble A-4 was used as a stand-in for the Mikoyan-Gurevich MiG-17 in dissimilar air combat training (DACT). It served in that role at TOPGUN until 1999. The A-4's nimble performance also made it suitable to replace the McDonnell Douglas F-4 Phantom II when the Navy downsized its aircraft for the Blue Angels demonstration team, until McDonnell Douglas F/A-18 Hornets were available in the 1980s. 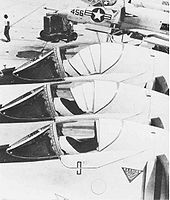 The last U.S. Navy Skyhawks, TA-4J models belonging to the composite squadron VC-8, remained in military use for target towing, and as adversary aircraft, for combat training at Naval Station Roosevelt Roads. These aircraft were officially retired on 3 May 2003. Skyhawks were well loved by their crews for being tough and agile. These attributes, along with their low purchase and operating cost as well as easy maintenance, have contributed to the popularity of the A-4 with American and international armed forces. Besides the U.S., at least three other nations have used A-4 Skyhawks in combat (Argentina, Israel, and Kuwait). VA-146 A-4Cs over the Gulf of Tonkin in August 1964; USS Kearsarge steams below. Skyhawks were the U.S. Navy's primary light attack aircraft used over North Vietnam during the early years of the Vietnam War; they were later supplanted by the A-7 Corsair II in the U.S. Navy light attack role. Skyhawks carried out some of the first air strikes by the US during the conflict, and a Marine Skyhawk is believed to have dropped the last American bombs on the country. 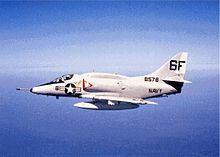 Notable naval aviators who flew the Skyhawk included Lieutenant Commanders Everett Alvarez, Jr. and John McCain, and Commander James Stockdale. On 1 May 1967, an A-4C Skyhawk piloted by Lieutenant Commander Theodore R. Swartz of VA-76 aboard the carrier USS Bon Homme Richard, shot down a North Vietnamese Air Force MiG-17 with an unguided Zuni rocket as the Skyhawk's only air-to-air victory of the Vietnam War. 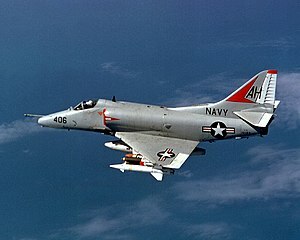 From 1956 on, Navy Skyhawks were the first aircraft to be deployed outside of the U.S. armed with the AIM-9 Sidewinder. On strike missions, which was the Skyhawk's normal role, the air-to-air armament was for self-defense purposes. In the early to mid-1960s, standard U.S. Navy A-4B Skyhawk squadrons were assigned to provide fighter protection for anti-submarine warfare aircraft operating from some Essex-class U.S. anti-submarine warfare carriers, these aircraft retained their ground- and sea-attack capabilities. The A-4B model did not have an air-to-air radar, and it required visual identification of targets and guidance from either ships in the fleet or an airborne Grumman E-1 Tracer AEW aircraft. Lightweight and safer to land on smaller decks, Skyhawks would later also play a similar role flying from Australian, Argentinean, and Brazilian upgraded World War II surplus light ASW carriers, which were unable to operate most large modern fighters. Primary air-to-air armament consisted of the internal 20 mm (.79 in) Colt cannons and ability to carry an AIM-9 Sidewinder missile on both underwing hardpoints, later additions of two more underwing hardpoints on some aircraft made for a total capacity of four AAMs. A U.S. Navy A-4E attacking a train in North Vietnam with a Zuni rocket. 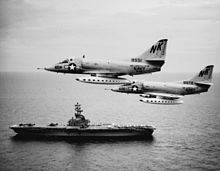 The first combat loss of an A-4 occurred on 5 August 1964, when Lieutenant junior grade Everett Alvarez, of VA-144 aboard USS Constellation, was shot down while attacking enemy torpedo boats in North Vietnam. Alvarez safely ejected after being hit by anti-aircraft artillery (AAA) fire, and became the first US Naval POW of the war; he was released as a POW on 12 February 1973. The last A-4 loss in the Vietnam War occurred on 26 September 1972, when USMC pilot Captain James P. Walsh, USMC of VMA-211, flying close air support from Bien Hoa Air Base, South Vietnam, was hit by ground fire during the Battle of An Lộc. Captain Walsh ejected safely and was the last U.S. Marine to be taken prisoner during the war. He was released as a POW on 12 February 1973. Although the first A-4Es were flown in Vietnam in early 1965, the A-4Cs continued to be used until late 1970. On 1 June 1965, the Chu Lai Short Airfield for Tactical Support (SATS) was officially opened with the arrival of eight A-4 Skyhawks from Cubi Point, Philippine Islands. The group landed with the aid of arresting cables, refueled and took off with the aid of JATO, with fuel and bombs to support Marine combat units. The Skyhawks were from Marine Attack Squadron VMA-225 and VMA-311. On 29 July 1967, the aircraft carrier USS Forrestal was conducting combat operations in the Gulf of Tonkin during the Vietnam War. A Zuni rocket misfired, striking an external tank on an A-4. Fuel from the leaking tank caught fire, creating a massive conflagration that burned for hours, killing 134 sailors, and injuring 161. During the war, 362 A-4/TA-4F Skyhawks were lost due to all causes. The U.S. Navy lost 271 A-4s, the U.S. Marine Corps lost 81 A-4s and 10 TA-4Fs. A total of 32 A-4s were lost to surface-to-air missiles (SAMs), and one A-4 was lost in aerial combat to a MiG-17 on 25 April 1967. The A-4 Skyhawk, in the two-seat TA-4J configuration, was introduced to a training role replacing the TF-9J Cougar. The TA-4J served as the advanced jet trainer in white and orange markings for decades until being replaced by the T-45 Goshawk. Additional TA-4Js were assigned to Instrument Training RAGs at all the Navy master jet bases under RCVW-12 and RCVW-4. The Instrument RAGs initially provided jet transition training for Naval Aviators during the time period when Naval Aviation still had a great number of propeller-driven aircraft and also provided annual instrument training and check rides for Naval Aviators. The assigned TA-4J models were installed with collapsible hoods so the aviator under training had to demonstrate instrument flying skills without any outside reference. These units were VF-126 at NAS Miramar, California; VA-127 (later VFA-127; NAS FALLON, NV) at NAS Lemoore, California; VF-43 at NAS Oceana, Virginia; and VA-45 (later VF-45) at NAS Cecil Field, Florida until its later move to NAS Key West, Florida. Additional single-seat A-4 Skyhawks were also assigned to composite squadrons (VC) worldwide to provide training and other services to deployed units. These included VC-1 at NAS Barbers Point, Hawaii; VC-7 at NAS Miramar, California; VC-5 at NAS Cubi Point, Republic of the Philippines; VC-8 at NS Roosevelt Roads, Puerto Rico; VC-10 at NAVBASE Guantánamo Bay, Cuba, and Naval Reserve squadrons VC-12 (later VFC-12) at NAS Oceana, Virginia and VC-13 (later VFC-13) at NAS Miramar, California until its later move to NAS Fallon, Nevada. With renewed emphasis on Air Combat Maneuvering (ACM) training brought on with the establishment of the Navy Fighter Weapons School (TOPGUN) in 1969, the availability of A-4 Skyhawks in both the Instrument RAGs and Composite Squadrons at the master jet bases presented a ready resource of the nimble Skyhawks that had become the TOPGUN preferred surrogate for the MiG-17. At the time, the F-4 Phantom was just beginning to be exploited to its full potential as a fighter and had not performed as well as expected against the smaller North Vietnamese MiG-17 and MiG-21 opponents. TOPGUN introduced the notion of dissimilar air combat training (DACT) using modified A-4E/Fs. Modified aircraft, called "Mongoose", lost the dorsal hump, the 20 mm cannon with their ammo systems, and the external stores, although sometimes the centerline station was kept. The slats were fixed. The A-4M was also operated by the Operations Maintenance Detachment (OMD) in an adversary role based at NAS Dallas, Texas for the Naval Air Reserve. Many of the aviators that flew the four jets were attached to NAS Dallas, including the Commanding Officer of the air station. The aircraft were instrumental in training and development of Air Combat Maneuvers(ACM) for Naval Air Reserve fighter squadrons VF-201 and VF-202 flying the F-4 Phantom II and later the Grumman F-14 Tomcat. The unit also completed several missions involving target towing to NAS Key West, Florida; NAS Kingsville, Texas, and deployments to NAS Miramar, California and NAS Fallon, Nevada for adversary support. The detachment was under the operational command of the Commander Fleet Logistics Support Wing (CFLSW), also based at NAS Dallas. An IAF A-4N on static display. Note the extended tailpipe. Israel was the largest export customer for Skyhawks. The Skyhawk was the first U.S. warplane to be offered to the Israeli Air Force, marking the point where the U.S. took over from France as Israel's chief military supplier. Deliveries began after the Six-Day War, and A-4s soon formed the backbone of the IAF's ground-attack force. In IAF Service, the A-4 Skyhawk was named as the Ayit (Hebrew: עיט‎, for Eagle). They cost only a quarter of what a Phantom II cost and carried more bombs. Starting in 1966, Israel purchased 217 A-4s, plus another 46 that were transferred from U.S. units in Operation Nickel Grass to compensate for large losses during the Yom Kippur War. In the late 1960s and 1970s, Israeli Air Force Skyhawks were the primary ground attack aircraft in the War of Attrition and the Yom Kippur War. Skyhawks carried out bombing missions in the Yom Kippur War, and a considerable proportion of the tactical sorties. ACIG.org claims that at least 9 A-4 Skyhawks were downed by MiG-21s and MiG-17s during Yom Kippur war. Formal Israeli sources claim only five Israeli Air Force aircraft, of any type, were shot down in air-to-air duels. In May 1970, an Israeli Skyhawk piloted by Col. Ezra Dotan shot down two MiG-17s over south Lebanon (one with unguided rockets, the other with 30mm cannon fire) even though the Skyhawk's heads-up display has no "air-to-air mode". However, up to three Skyhawks were downed by Egyptian MiG-21 fighters, plus two were downed by Soviet-piloted MiG-21s during the War of Attrition. A special version of the A-4 was developed for the IAF, the A-4H. This was an A-4E which featured improved avionics and the improved thrust J52-P-8A engine. Armament consisted of twin DEFA 30 mm cannon in place of the Colt Mk.12 20 mm cannons. Later modifications included the avionics hump and an extended tailpipe, implemented in Israel by IAI. The extended tailpipe gave greater protection against heat-seeking surface-to-air missiles. A total of 90 A-4Hs were delivered, and were Heyl Ha'avir's (Israels Air Force) primary attack plane in the War of Attrition. In early 1973, the improved A-4N Skyhawk for Israel entered service, based on the A-4M models used by the U.S. Marine Corps. The different model Skyhawks carried out bombing missions in the Yom Kippur War, and a considerable proportion of the tactical sorties. They also attacked in Operation Peace for the Galilee, and one of them shot down a Syrian MiG-17. The IAF also operated two-seat models, for operations as well as advanced training and retraining. The first training models arrived in 1967, with the first batch of Skyhawks. During the Yom Kippur war, the Skyhawk order of battle was reinforced with TA-4F and TA-4J models. The IAF selected in 2003 RADA Electronic Industries Ltd. to upgrade its A-4 trainer fleet with weapon delivery, navigation and training systems. Integration of a multifunction and Head-up Display produced an advanced Lead in fighter trainer for the IAF's future fighter pilots. According to acig.org, two Israeli A-4 Skyhawks were downed by Syrian MiG-23s over northern Lebanon On 26 April 1981. Official Israeli Air Force statistics do not list any downing of Israeli warplanes since the Yom Kippur War. During the 1982 Lebanon War an Israeli A-4 piloted by Aharon Achiaz was shot down over Lebanon by a SA-7 on 6 June 1982. Israel claimed this was one of its only two fixed-wing aircraft shot down over the Beqaa Valley during the air battle of 6 June 1982 to 11 June 1982 where 150 aircraft took part. In October 2008, it was decided due to maintenance issues that the A-4 Skyhawk fleet would be withdrawn and replaced by more modern aircraft, able to perform equally well in the training role and, if required, close support and interdiction missions on the battlefield. Some of Israel's A-4s were later exported to Indonesia. The Skyhawks have been replaced by F-16s in combat roles but are still used for pilot training. All the remaining A-4s aircraft were to be fully phased out beginning by 2014 as the IAF accepts delivery of Alenia Aermacchi M-346 Master jets. Skyhawks were used to drop leaflets to Gaza in 2012. In July 2013, Israel began a program called Teuza (boldness) for the purpose of turning some military bases into sales lots for obsolete IDF equipment. Older models that are not suited for Israel's modern high-tech forces will be sold off, or sold for scrap if there are no buyers. A-4 Skyhawk jets are among those being offered. On 13 December 2015, all remaining Israeli A-4 Skyhawks were retired from service. The retirement ceremony took place at Hatzerim IDF base. Argentina was the first foreign user of the Skyhawk and had nearly 130 A-4s delivered since 1965. The Argentine Air Force received 25 A-4Bs in 1966 and another 25 in 1970, all refurbished in the United States by Lockheed Service Co. prior to their delivery as A-4P, although they were still locally known as A-4B. They had three weapon pylons and served in the 5th Air Brigade (Spanish: V Brigada Aérea). In 1976, 25 A-4Cs were ordered to replace the F-86 Sabres still in service in the 4th Air Brigade (Spanish: IV Brigada Aérea). They were received as is and refurbished to flight status by Air Force technicians at Río Cuarto, Córdoba. The C model had five weapon pylons and could use AIM-9B Sidewinder air-to-air missiles. The Argentine Naval Aviation also bought the Skyhawk known as A-4Q in the form of 16 A-4Bs plus two for spare parts, modified with five weapon pylons and to carry AIM-9B Sidewinders. They were received in 1971 to replace Grumman F9F Panther and Grumman F9F Cougar in use from the aircraft carrier ARA Veinticinco de Mayo by the 3rd Fighter/Attack Squadron (Spanish: 3ra Escuadrilla Aeronaval de Caza y Ataque). The U.S. placed an embargo of spare parts in 1977 due to the Dirty War backing the Humphrey-Kennedy amendment to the Foreign Assistance Act of 1976, the Carter administration placed an embargo on the sale of arms and spare parts to Argentina and on the training of its military personnel (which was lifted in the 1990s under Carlos Menem's presidency when Argentina became a major non-NATO ally). Ejection seats did not work and there were many other mechanical faults. In spite of this, A-4s still served well in the 1982 Falklands War. During the 1982 Falklands War, Argentina deployed 48 Skyhawk warplanes (26 A-4B, 12 A-4C and 10 A-4Q aircraft). Armed with unguided bombs and lacking any electronic or missile self-defense, Argentine Air Force Skyhawks sank the Type 42 destroyer Coventry and the Type 21 frigate Antelope as well as inflicting heavy damage on several others: RFA Sir Galahad (which was subsequently scuttled as a war grave), the Type 42 Glasgow, the Leander-class frigate Argonaut, the Type 22 frigate Broadsword, and RFA Sir Tristram. Argentine Navy A-4Qs, flying from Río Grande, Tierra del Fuego naval air station, also played a role in the bombing attacks against British ships, destroying the Type 21 Ardent. 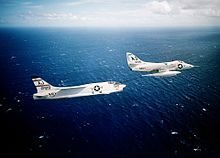 In all, 22 Skyhawks (10 A-4Bs, nine A-4Cs, and three A-4Qs) were lost to all causes in the six-week-long war. These losses included eight to British Sea Harriers, seven to ship-launched surface-to-air missiles, four to ground-launched surface-to-air missiles and anti-aircraft fire (including one to "friendly fire"), and three to crashes. In 1983, the United States vetoed the delivery by Israel of 24 A-4Hs for the Argentine Navy as the A-4Q replacement. The A-4Qs were finally retired in 1988. Kuwaiti Air Force Skyhawks fought in 1991 during Operation Desert Storm. When Iraq invaded Kuwait, the available Skyhawks flew attack missions against the advancing Iraqi forces from deserted roads after their bases were overrun. A total of 24 of the 29 A-4KUs that remained in service with Kuwait (from 36 delivered in the 1970s) escaped to Saudi Arabia. The escaped Skyhawks (along with escaped Dassault Mirage F1s) operated as the Free Kuwait Air Force, flying 1,361 sorties during the liberation of Kuwait. Twenty-three A-4s survived the conflict and the Iraqi invasion, with only one A-4KU (KAF-828, BuNo. 160207) shot down by Iraqi radar-guided SAM on 17 January 1991. The pilot, Mohammed Mubarak, ejected and was taken prisoner. The remaining Kuwaiti Skyhawks were later sold to Brazil, where they served aboard the aircraft carrier NAe São Paulo until prior to its decommissioning in February 2017. Twenty A-4G skyhawks were operated by the Royal Australian Navy for operation from HMAS Melbourne. These aircraft were acquired in two batches of 10 Skyhawks in 1967 and 1971, and were primarily used to provide air defence for the fleet. Ten of the A-4Gs were destroyed in accidents, and all of the survivors were sold to the Royal New Zealand Air Force in 1984. In 1970, 14 A-4K aircraft were delivered to the Royal New Zealand Air Force. These were later joined by 10 A-4G Skyhawks from the Royal Australian Navy in 1984; all 10 ex-RAN and the 12 surviving original RNZAF aircraft were converted to the A-4K Kahu standard. In 2001 the three Air Combat Force squadrons (Nos 2, 14, and 75) were disbanded and the Skyhawks put into storage awaiting sale. They were maintained, with occasional servicing flights, and then moved to RNZAF Base Woodbourne, where they were preserved in protective latex. Draken International signed an agreement with the New Zealand government in 2012 to purchase eight A-4Ks and associated equipment for its adversary training services. Six were former RAN A-4G airframes  which as carrier aircraft had logged significantly fewer flying hours. These were subsequently relocated to the U.S. at Draken's Lakeland Linder International Airport facility in Lakeland, Florida. The other A-4K aircraft were given to museums in New Zealand and Australia. Due to the declining relationship between Indonesia and the Soviet Union, there was a lack of spare parts for military hardware supplied by the Communist Bloc. Soon, most of them were scrapped. The Indonesian Air Force (TNI-AU) acquired A-4 Skyhawks to replace its Il-28 Beagles and Tu-16 Badgers in a covert operation with Israel, since both countries did not maintain diplomatic relationships. These A-4s were chosen because the IDF planned to retire its A-4 squadrons. The A-4 served the Indonesian Air Force from 1982 until 2003. In 1982, Malaysia purchased 80 refurbished A-4C and A-4L under a modernization program called PERISTA. Forty of the airframes were upgraded with the Hughes AN/ASB-19 Angle Rate Bombing System, air refueling capability, and increased payload, while the rest were kept in the United States as a reserve and for spare parts. This modified version was redesignated as A-4PTM (peculiar to Malaysia). The aircraft were delivered to the Royal Malaysian Air Force (RMAF) in December 1984 where they served in the No.6 and No.9 RMAF Squadrons at Kuantan air base. While in service, they suffered from frequent maintenance issues and a high accident rate. In 1995, they were finally retired and replaced with BAE Systems Hawks. As of 2014, Brazil was the latest Skyhawk customer. In 1997 Brazil negotiated a $70 million contract for purchase of 20 A-4KU and three TA-4KU Skyhawks from Kuwait. Kuwait's Skyhawks, modified A-4Ms and TA-4Js delivered in 1977, were among the last of those models built by Douglas. The aircraft were selected by Brazil because of low flight time, excellent physical condition, and a favorable price. The Brazilian Navy re-designated AF-1 and AF-1A Falcões (Hawks), the Kuwaiti Skyhawks arrived in Arraial do Cabo on 5 September 1998. On 18 January 2001, an AF-1 trapped aboard the Brazilian aircraft carrier Minas Gerais was later successfully catapulted, making Brazil's fixed-wing carrier force operational again after nearly two decades. To replace the aging Minas Gerais, Brazil purchased the surplus French aircraft carrier Foch on 15 November 2001. Renamed São Paulo, the "new" carrier received extensive refitting before becoming operational in 2003. Minas Gerais was decommissioned and retired that year. On 14 April 2009, Embraer signed a contract to modernize 12 Brazilian Navy aircraft, nine AF-1s (single-seat) and three AF-1As (two-seat). This upgrade will restore the operating capacity of the Navy 1st Intercept and Attack Plane Squadron. The program includes restoring the aircraft and their current systems, as well as implementing new avionics, radar, power production, and autonomous oxygen generating systems. The first of the 12 modified Skyhawks was delivered on 27 May 2015. Embraer stated the modifications will allow the aircraft to remain operational until 2025. In 2017, the Brazilian Navy indicated that it was reconsidering the total number of aircraft to be modernized to AF-1B/C standard due to budget constraints and the decommissioning of the São Paulo. Two AF-1Bs were delivered in 2015 and a further two of undisclosed type are to be delivered in 2017. It is believed that despite the loss of its only carrier, the Navy wants to retain the experience of carrier-based operations, and thus will not rescind the contract outright. Top Aces, formerly Discovery Air Defense Services, a private Canadian company contracted by the Canadian Forces, Australian Defence Forces, and Bundeswehr to provide air combat and fighter training, imported and registered ten A-4N and TA-4J aircraft. Discovery upgraded and modified the jets to be capable of Electronic Warfare training. [third-party source needed] Top Aces also operates A-4Ns under contract for training of the German Armed Forces (Bundeswehr). Another major civil user of A-4s for training support to military forces is US-based Draken International, which operates ex-New Zealand A-4Ks as part of a diverse fleet of jets. A-4s have previously been operated in the target support role in Germany by Tracor Flight Systems. VA-81 A4D-2 on USS Forrestal in 1962. A-4C landing on USS Kitty Hawk in 1966. (YA-4A, later A-4A): Flight test prototypes and pre-production aircraft (pre-1962 designation). Proposed advanced avionics version, none built (pre-1962 designation). Long-range version with new wings; cancelled. Strengthened aircraft and added air-to-air refueling capabilities, improved navigation and flight control systems, provision for AGM-12 Bullpup missile, 542 built. Night/adverse weather version of A4D-2, with AN/APG-53A radar, autopilot, LABS low-altitude bombing system. Wright J65-W-20 engine with 8,200 lbf (36 kN) of takeoff thrust, 638 built. Designation not used to avoid confusion with the pre-1962 designation A4D. Major upgrade, including new Pratt & Whitney J52-P-6A engine with 8,400 lbf (37 kN) of thrust, strengthened airframe with two more weapon pylons (for a total of five), improved avionics, with TACAN, Doppler navigation radar, radar altimeter, toss-bombing computer, and AJB-3A low-altitude bombing system. Many later upgraded with J52-P-8 engine with 9,300 lbf (41 kN) thrust; 499 built. Refinement of A-4E with extra avionics housed in a hump on the fuselage spine (this feature later retrofitted to A-4Es and some A-4Cs), wing-top spoilers to reduce landing roll out, nose wheel steering, and more powerful J52-P-8A engine with 9,300 lbf (41 kN) of thrust, later upgraded in service to J52-P-408 with 11,200 lbf (50 kN), 147 built. Some served with Blue Angels acrobatic team from 1973 to 1986. Eight aircraft built new for the Royal Australian Navy with minor variations from the A-4F; in particular, they were not fitted with the avionics "hump". Subsequently, eight more A-4Fs were modified to this standard for the RAN. Significantly the A-4G were modified to carry four underwing Sidewinder AIM-9B missiles increasing their Fleet Defense capability. Sold in 1984 to the Royal New Zealand Air Force and later rebuilt in Project KAHU as A-4Ks. 90 aircraft for the Israeli Air Force based on the A-4F. Used 30 mm (1.18 in) DEFA cannon with 150 rpg in place of U.S. 20 mm (.79 in) guns. Later, some A-4Es later locally modified to this standard. Subsequently, modified with extended jetpipes as protection against heat-seeking missiles. 10 aircraft for Royal New Zealand Air Force. In the 1990s, these were upgraded under Project KAHU with new radar and avionics, provision for AGM-65 Maverick, AIM-9 Sidewinder, and GBU-16 Paveway II laser-guided bomb. The RNZAF also rebuilt an A-4C and 10 A-4Gs to A-4K standard. Dedicated Marine version with improved avionics and more powerful J52-P-408a engine with 11,200 lbf (50 kN) thrust, enlarged cockpit, IFF system. Later fitted with Hughes AN/ASB-19 Angle Rate Bombing System (ARBS) with TV and laser spot tracker, 158 built. 117 modified A-4Ms for the Israeli Air Force. Conversion trainer – standard A-4F with extra seat for an instructor, 241 built. two trainer versions of the A-4G built new, and two more modified from TA-4Fs. 25 trainer versions of the A-4H. Upgraded with more modern avionics, projected out of service date;2010. Dedicated trainer version based on A-4F, but lacking weapons systems, and with down-rated engine, 277 built new, and most TA-4Fs were later converted to this configuration. Four trainer versions of the above. A fifth, non-flying display example was later assembled in NZ from spare parts. Two A-4Es modified as prototypes of a trainer version. Four TA-4Fs converted for ECM training. 100 A-4Cs remanufactured for Marine Corps Reserves and Navy Reserve squadrons. Fitted with A-4F avionics (including the fuselage "hump") but retaining J-65 engine and three-pylon wing. 23 TA-4Fs modified for Forward Air Control duties. 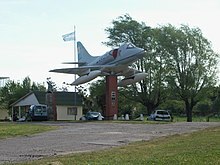 Remanufactured A-4Bs sold to Argentine Air Force, known as A-4B by the Argentines. Remanufactured A-4Bs sold to Argentine Navy. Provisional designation for A-4Ms modified with the ARBS. Designation never adopted by the U.S. Navy or U.S. Marine Corps. 36 A-4Ms refurbished for Argentina. Refurbished two-seat training version for Argentina. 30 modified A-4Ms for the Kuwaiti Air Force. Brazil purchased 20 of these second-hand and redesignated them AF-1. Now used by the Brazilian Navy on carrier duty. A proposed two seat variant for the Royal Canadian Navy based on the A-4E with a dorsal conformal fuel tank instead of an avionics hump, it was to have replaced the F2H-3 Banshee on HMCS Bonaventure. Canada expressed little interest and so it was never placed in production. Three trainer versions of the above. Brazil purchased some of these second-hand and redesignated them AF-1A. 40 A-4Cs and A-4Ls refurbished for Royal Malaysian Air Force, incorporating many A-4M features (PTM stands for Peculiar to Malaysia). Unique trainer version for Royal Malaysian Air Force. Converted from A-4C/L airframes with 28" fuselage plug and second cockpit, similar to TA-4F/J (PTM stands for Peculiar to Malaysia). 50 A-4Bs remanufactured for Republic of Singapore Air Force. Seven trainer versions of the above. Different from most TA-4 trainers with a common cockpit for the student and instructor pilot, these were essentially rebuilt with a 28 in (710 mm) fuselage plug inserted into the front fuselage and a separate bulged cockpit (giving better all round visibility) for the instructor seated behind the student pilot. 50 A-4Cs remanufactured for Republic of Singapore Air Force. Eight trainer versions of the above. These were designated as TA-4S-1 to set it apart from the earlier batch of seven airframes. Extensively modified and updated version of the A-4S-1, exclusively for the Republic of Singapore Air Force (RSAF), fitted with a General Electric F404 non-afterburning turbofan engine, and modernized electronics. Extensively modified and updated version of the TA-4S & TA-4S-1 to TA-4SU standard. Brazilian Navy designation applied to 23 A-4KU and TA-4KU aircraft acquired from the Kuwaiti Air Force. Brazilian Navy upgraded version of AF-1/1A by Embraer and AEL Sistemas. Changes from analog to digital avionics, new radar systems, improved communications equipment and weapons. Argentine Air Force – use the modernized version A-4AR as fighter and fighter trainer. Draken International – owns and operates 7 former New Zealand A/TA-4K, and 6 former IDF A-6N. AeroGroup, a private American commercial company, previously owned A-4 aircraft. A-4L, LLC - Owns seven and currently operates three A-4L (A4D-2N) Skyhawks based at KGYI North Texas Regional Airport/Perrin Field in Denison Texas. Brazilian Navy – carrier-based fighter. Israeli Air Force – retired from frontline duty in 2008, retired from training flights in December 2015. Republic of Singapore Air Force retired from frontline service in 2005, and were transferred to France (Cazaux Air Base) as advanced jet trainers. The Skyhawks were retired from training flights from 2013 and replaced by the Alenia Aermacchi M-346. 1 RSAF A-4SU was donated to the Institute of Technical Education (ITE College Central) for vocational and training purposes. Given the number of air forces that operated the Skyhawk, a significant number has been preserved, either airworthy or on display. ^ a b John, Golan. "Heinemann's Hot Rod". history dot org. World History Group. Retrieved 28 August 2017. ^ Kilduff 1983, pp. 14–15. ^ Wilson 1993, p. 135. ^ a b Golan, John. "Heinemann's Hotrod". history dot net. World History Group. Retrieved 28 August 2017. ^ "Technical Data." Archived 14 August 2014 at the Wayback Machine a4skyhawk.org. Retrieved: 21 November 2015. ^ "Skyhawk." Air Victory Museum. Retrieved: 1 October 2012. ^ "Douglas A-4F Skyhawk II." Museum of Flight. Retrieved: 1 October 2012. ^ "Collections - Aircraft - Skyhawk (A4D/A-4/TA-4)." Archived 12 October 2007 at the Wayback Machine National Museum of Naval Aviation. Retrieved: 31 October 2007. ^ Gann Wings of Fame No. 4, p. 99. ^ Elward 2000, p. 25. ^ Gann Wings of Fame No. 4, p. 103. ^ "AV-8B Harrier." Archived 4 August 2011 at the Wayback Machine Military Analysis Network (Federation of American Scientists). Retrieved: 11 June 2011. ^ "VA 42, p. 15." history.navy.mil. Retrieved: 13 September 2009. ^ "VA-93 Blue Blazers: Events 15 October 1963." Archived 16 May 2015 at the Wayback Machine skyhawk.org. Retrieved: 1 October 2012. ^ "USS Bennington (CV-20)." Navysite. Retrieved: 1 October 2012. ^ Dorr and Bishop 1996, pp. 34, 36. ^ "USN / USMC A-4 Skyhawk Aviators Killed In Action, Missing In Action, Operational Losses, Prisoners Of War, Wounded In Action, Combat Recoveries and Operations Recoveries - 1954 to 1991." Archived 13 October 2010 at the Wayback Machine a4skyhawk.org, 5 July 2010. Retrieved: 23 November 2010. ^ Naval Review 1968, p. 13. ^ "Skyhawk Mongoose and Super Fox." Archived 8 December 2015 at the Wayback Machine http://a4skyhawk.org. Retrieved: 27 November 2015. ^ "Squadrons: Units: The Flying Tiger." Israeli Air Force. Retrieved: 19 January 2012. ^ a b c "Israel Defense Forces (IDF)." Archived 22 June 2012 at the Wayback Machine a4skyhawk.org. Retrieved: 30 September 2012. ^ "Syrian Air-to-Air Victories since 1948". acig.org. 25 September 2003. Archived from the original on 10 July 2013. ^ a b Peeters, Sander. "Egyptian Air-to-Air Victories since 1948." acig.org. Retrieved: 21 November 2015. ^ "Iraqi Air-to-Air Victories since 1967." acig.org. Retrieved: 21 November 2015. ^ "Downings." Israeli Air Force. Retrieved: 28 December 2013. ^ "Skyhawk." Israeli Air Force. Retrieved: 27 November 2015. ^ Gordon, Yefim. "MiG-21" (Russian Fighters). Earl Shilton, Leicester, UK: Midland Publishing Ltd., 2008. ^ "Two MiG-23MS, which were on low orbit over northern Lebanon, were vectored to intercept, and they were successful in shooting two A-4 Skyhawks down." acig.org. Retrieved: 21 November 2015. 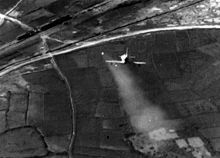 ^ [url=http://www.iaf.org.il/43-he/IAF.aspx "Downings."] Israeli Air Force. Retrieved: 25 November 2015. ^ "Israel vs. the PLO: The Invasion of Lebanon 1982, Part 2." YouTube.com. Retrieved: 31 August 2010. ^ "Lebanon Losses." Archived 15 April 2016 at the Wayback Machine waronline.org. Retrieved: 31 August 2010. ^ a b Tetro, Nicholas B. "Press reports of the capture of Zachary Baumel, Yehuda Katz, and Zvi Feldman." skywar.ru. Retrieved: 31 August 2010. ^ "Israel’s Skyhawk Scandal Leads to End of an Era." Defense Industry Daily. Retrieved: 30 March 2010. ^ Egozi, Arie. "Israel selects Alenia Aermacchi M-346 for trainer deal." Flightglobal.com. Retrieved: 17 February 2012. ^ Katz, Yaakov. "Italy wins IAF with combat trainer jet bid." Jerualem Post. Retrieved: 16 February 2012. ^ "Israeli Air Force using combat trainers to drop leaflets over Gaza." theaviationist.com. Retrieved: 3 February 2013. ^ "Israel's Military Equipment Disposals." Archived 19 July 2013 at the Wayback Machine Armedforces-Int.com, 16 July 2013. Retrieved: 27 November 2015. ^ "Argentina Industry." globalsecurity.org. Retrieved: 30 March 2010. ^ "Overview of U.S. Policy towards South America and the President's Upcoming Trip to the Region." commdocs.house.gov. Retrieved: 14 March 2010. ^ Freed, Kenneth. "Argentina pilots emerge as heroes in Falklands strife." Los Angeles Times, 27 May 1982. Retrieved: 14 March 2010. ^ a b Chant 2001, p.76. ^ Smith, Gordon. "Argentine Aircraft and Successes against British Ships." naval-history.net. Retrieved: 12 August 2008. ^ Elward 2000, p. 158. ^ "Caza Bombarderos de la Aviación Naval: Douglas A4-Q Skyhawk". (in Spanish) Historia y Arqueologia Marítima. Retrieved: 12 April 2010. ^ Elward 2000, p. 164. ^ Gann Wings of Fame No. 5, p. 142. ^ "Kuwait Skyhawks in Gulf War - A-4 Skyhawk Association". a4skyhawk.info. Retrieved 14 April 2018. ^ Jim Winchester (30 September 2004). Douglas A-4 Skyhawk: Attack & Close-Support Fighter Bomber. Pen and Sword. pp. 141–. ISBN 978-1-84415-085-4. ^ "Gulf War POWs." Archived 28 December 2017 at the Wayback Machine Ejection history. Retrieved: 30 September 2012. ^ Baugher, Joe. "Douglas A-4KU/TA-4KU Skyhawk for Kuwait". Archived 11 June 2009 at the Wayback Machine A-4 Skyhawk, 6 November 2001. Retrieved: 12 August 2008. ^ Aronson, Cathy (21 May 2001). "RAF looks to snap up NZ Skyhawk pilots". Retrieved 19 July 2017. ^ "Review of the Options for an Air Combat Capability (February 2001)". New Zealand Ministry of Defence. Archived from the original on 4 October 2006. Retrieved 26 January 2010. ^ Stuart, I "Skyhawk for sale, as is, where is." Stuff(Dominion/Press) 19 April 2011. ^ "A-4 Skyhawks. Back to the Future 2007-1970." TV3 (NZ), 12/2007. ^ Simms, D. "The Skyhawks' final resting places." Pacific Wings, October 2013, pp. 18–27. ^ "Draken International Commercial Air Services." Defense Media Network. Retrieved: 21 November 2015. ^ "New life for RNZAF jet." The Dominion Post. Retrieved: 19 March 2014. ^ ""Isrrael." Archived 22 June 2012 at the Wayback Machine a4skyhawk.org. Retrieved: 21 November 2015. ^ "Top Secret: "Operasi Alpha"; Sangat Rahasia Era Rezim Orde Baru, Terkuak!" Indocropcircles.wordpress.com. Retrieved: 21 November 2015. ^ "Protecting Brazil’s Riches". Diálogo, 3 January 2012. Retrieved: 27 January 2012. ^ "Conhecendo o A-4KU Skyhawk II" (in Portuguese). Poder Aéreo, 6 June 2012. Retrieved: 27 January 2012. ^ "NAeL Minas Gerais - Brazilian Navy." Archived 29 February 2012 at the Wayback Machine Save the Vengeance, 2002. Retrieved: 9 November 2012. ^ "Embraer to Modernize Brazilian Navy AF-1 and AF-1A Jets". Archived 11 July 2011 at the Wayback Machine Reuters, 14 April 2009. Retrieved: 27 January 2012. ^ "Brazilian Navy receives modernized A-4 Skyhawk." UPI, 27 May 2015. Retrieved: 27 May 2015. ^ Barreira, Victor (2 August 2017). "Brazil re-thinks Skyhawk upgrade programme". IHS Jane's Defence Weekly. 54 (31): 11. ^ "Top Aces - McDonnell Douglas A-4N". discoveryair-ds.com. Retrieved 14 April 2018. ^ "Top Aces - Discovery Air announces new airborne training services contract with the German Armed Forces". discoveryair-ds.com. Retrieved 14 April 2018. ^ Drew, Paul (24 May 2016). "CAE proposes 16 Draken A-4 Skyhawks for RCAF fighter training". Flightglobal. Retrieved 16 March 2019. ^ Giangreco, Leigh (18 August 2016). "Commercial A-4 Skyhawk crashes near Nellis". Flightglobal. Retrieved 16 March 2019. ^ "ANALYSIS: How Draken International became the world's biggest private air force". Flightglobal. 3 September 2014. Retrieved 16 March 2019. ^ "McDonnell Douglas A4G Skyhawk." Archived 19 May 2009 at the Library of Congress Web Archives Royal Australian Navy. Retrieved: 27 November 2015. ^ Elward 2000, p. 163. ^ Elward 2000, pp. 71–72. ^ "OA-4M." Archived 22 November 2015 at the Wayback Machine a4skyhawk.org/ A-4 Skyhawk Association. Retrieved: 21 November 2015. ^ "ASN Wikibase Occurrence # 153270." aviation-safety.net. Retrieved: 5 May 2013. ^ "Canada Skyhawk Proposal." Archived 14 April 2012 at the Wayback Machine a4skyhawk.org. Retrieved: 21 November 2015. ^ a b "Royal Malaysian Air Force." Archived 22 June 2012 at the Wayback Machine a4skyhawk.org. Retrieved: 1 October 2012. ^ "Embraer hands first modernized AF-1B carrier jet to Brazilian Navy". Flightglobal. 2015. Retrieved 19 July 2016. ^ "Marinha do Brasil: Primeiro voo do protótipo do Programa de Modernização das Aeronaves AF-1". 2016. Retrieved 19 July 2016. ^ a b "Directory: World Air Forces", Flight International, 11–17 November 2008. ^ "AeroGroup Concludes F-16 Pilot Training Contract with the Air Education and Training Command (AETC) for the Belgian Air Force, Belgian Air Component." Pr.com, 31 January 2014. Retrieved: 27 November 2015. ^ http://www.ynetnews.com/articles/0,7340,L-4738755,00.html "IAF retires Skyhawk after 48 years in service. ^ "A-4 Specifications." globalsecurity.org. Retrieved: 30 September 2012. ^ "Douglas Escapac Series - The Ejection Site" ejectionsite.com. Retrieved: 18 February 2019. ^ "AN/APN - Equipment Listing." Designation-Systems.net. Retrieved: 30 September 2012. ^ "AN/APQ - Equipment Listing." Designation-Systems.net. Retrieved: 30 September 2012. Aloni, Shlomo. Israeli A-4 Skyhawk Units in Combat (Osprey Combat Aircraft #81). Oxford, UK: Osprey Publishing Limited, 2009. ISBN 978-1-84603-430-5. "ASN Wikibase Occurrence # 153270." aviation-safety.net. Retrieved: 5 May 2013. Chant, Chris. Air War in the Falklands 1982 (Osprey Combat Aircraft #28). Oxford, UK: Osprey Publishing, 2001. ISBN 978-1-84176-293-7. McCarthy, Donald J. Jr. MiG Killers: A Chronology of US Air Victories in Vietnam 1965–1973. North Branch, Minnesota: Specialty Pr Pub & Wholesalers, 2009. ISBN 978-1-58007-136-9. Mersky, Peter. US Navy and Marine Corps A-4 Skyhawk Units of the Vietnam War (Osprey Combat Aircraft #69). Oxford, UK: Osprey Publishing Limited, 2007. ISBN 978-1-84603-181-6. Padin, Núñez and Jorge Felix. McDonnell Douglas A-4C Skyhawk, Volume 21 (Serie Fuerza Aérea). Bahía Blanca, Argentina Fuerzas Aeronavales, 2011 ISBN 978-987-1682-11-9. Padin, Núñez and Jorge Felix.McDonnell Douglas A-4Q & A-4E Skyhawk, Volume 31 (Serie Aeronaval) Bahía Blanca, Argentina Fuerzas Aeronavales, 2013. ISBN 978-987-1682-23-2. Wikimedia Commons has media related to A-4 Skyhawk.